Pennsylvania has been flirting with the idea of allowing PA online casinos for several years. Finally, in 2017 we had good news: The PA House and PA Senate both approved legislation to allow PA online casinos, online poker, daily fantasy sports, and a number of other expansions to gaming in the Keystone State. Then, on Oct. 30 2017, PA Gov. 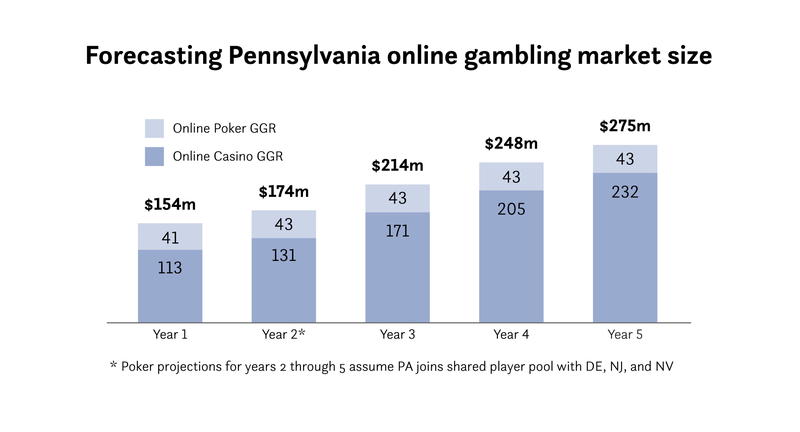 Tom Wolf signed the state’s gaming expansion into law, meaning that Pennsylvania is officially the fourth state to authorize some form of legal online gambling. Many predicted that 2017 would be the year for Pennsylvania online casinos, and it turns out they were right. The Pennsylvania House passed legislation to allow iGaming in PA on Oct. 25, 2017; the PA Senate passed it the day prior. After a weekend of speculation as to what Wolf would do, he signed the bill on Monday, Oct 30. No state has passed online gambling legalization since NJ did so in February 2013. Now, Pennsylvania gamers won’t have long to wait; the legal market is expected to open within a 6-12 month timeframe, meaning games will be live before the end of 2018. Pinpointing how much money would flow through legal PA online casinos is not terribly easy. However, estimates say online gambling revenue would land around $154 million in the first year. The final number depends at least somewhat on the final form regulation takes for PA online casinos. Questions remain about the number of skins and brands that will be permitted, along with other open-ended questions. With more available licenses, and if most land-based casinos get involved, the ceiling could end up on the high end. It appears that most of the casinos in Pennsylvania will seek to get involved in online gambling in PA. The total current market for PA casinos — which were legalized a decade ago — eclipses $3.2 billion. So the legalization of online gambling would likely represent an increase of about 10 percent — give or take. Pennsylvania can look to the New Jersey online casino market, which saw online gambling help Atlantic City to its best revenue numbers in 10 years in 2016, as an example of what to expect from a nearly mature iGaming environment. The state legislature has been taking a look at the issue of online gambling since 2013. But last year was the first time that the legislative effort gained real traction. Online gambling was a major part of discussions regarding PA casinos throughout 2016. The House of Representatives twice passed large gambling bills that included online gambling, but the Senate refused to act on either. At one point, the statehouse and Gov. Tom Wolf agreed to fund the 2016-2017 fiscal year budget with $100 million in revenue from gambling. Almost all of that revenue earmarked for the budget would come from online gambling. That agreement between Wolf and the legislature did not result in a gambling bill being passed. The state budget crisis. Pennsylvania needed to generate revenue to plug a $2 billion funding gap. The state government needed to fix a tax on casinos benefiting their host jurisdictions. The state Supreme Court struck down a law regarding this tax as unconstitutional in 2016. Daily fantasy sports was legalized and regulated by a number of states in 2016. Pennsylvania revisited and passed DFS regulation in 2017. Tablet gaming, online lottery, video gaming terminals (VGTs), and mini-casinos also made it into the final bill.